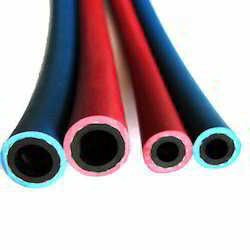 We are a leading Manufacturer of rubber heat resistant carbon free tube, carbon free hose, carbon free rubber hose and heat resistant carbon free hoses from Ahmedabad, India. A special synthetic carbon free white tube is used for high temp resistance and electrical resistance. Reinforced with cotton/synthetic fibres/pliers. A heat and weather resistant red or green or asbestos outer cover for longer life. We are offering Carbon Free Hose. 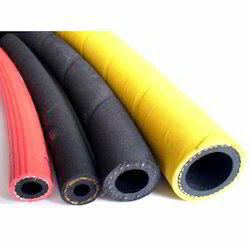 Due to the characteristics of abrasion and weather resistance Carbon Free Rubber Hose offered by us are known to have longer life. Their high flexibility as well as adequate toughness makes passage of electrical cable assembly through the hose very easy. These hoses are specially designed to provide 100% efficiency even in your toughest working environments. Our customers always count on our carbon free hose for optimal performance. We can even manufacture these hoses as per clients’ specifications at a competitive prices. Asbestos Covered Furnace Coolant Heat Resistant Carbon Free Hoses Especially designed for service in iron and steel Mills, Glass Asbestos covered furnace coolant heat resistant carbon free hoses works, electrical furnaces and out fields where the hose is required to resistant to heat, radiation, open flame and splashes of hot metal. 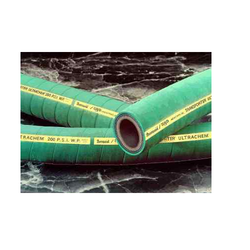 Non- conductive (electrical) hose used as an outer protective covering for power cables in steel mills, glass works etc. To avoid damage to cable, leakage of current due to exposure to open flame splashes of hot metal or radiation. Used for conveying power cable with a mix of oil as an additional protection from exposure to extremely high temperature radiation from steel furnace open flame etc.